I woke up about 6am after what was actually a pretty good sleep. I packed up the car etc and got everything ready to go, so the locals didn't think I was just staying all day, as someone in one of the houses was watching me pretty intensely. I had breakfast and then basically just wasted time until 8am, when I took the car down the road to the workshop. As planned I left the car with them at 8am, and went next door to a little take away cafe with some seating outside. He said he didn't know how long it would take, but would let me know as soon as it was done. Fortunately it was quite a nice morning and not too hot, so I just listened to music, played iPhone games and read the paper until it was done. The guy came over and told me it was done just before 11am, which I was thankful for as you can only sit about for so long. They did what appears to be a fantastic job; the cigarette lighter was working and fixed back in place securely (as it had broken loose before), and the clock etc on the dashboard was working again! I was expexting to have to pay upwards of 50 bucks, so when he only asked for 30 it made my morning. From there I went back to Macca's for a little while to use the Internet again, as I expected to have a few messages back after yesterday. Sure enough mum and all my mates had got back to me so it was brilliant to hear from them, especially a story about Jordan Wilmott getting taken home by the police which made me laugh out loud. Without sounding like a complete 'soppy k*** s' (as Dan or Charlie would say) I couldn't help but smile when Lorraine had messaged me to..
After Macca's it was on the road south again, heading for 'Sawtell'. This was only about 25 minutes south of Coffs so I has barely got going by the time I got there. As half expected I arrived to find near enough no waves...back into a flat spell until the end of the week unfortunately. Sawtell beach however was pretty beautiful, so I went for a walk and round the southern headland which was pretty nice. There wasn't much else to the place really, and it was only just after 1pm, so I thought why not get back in the car. 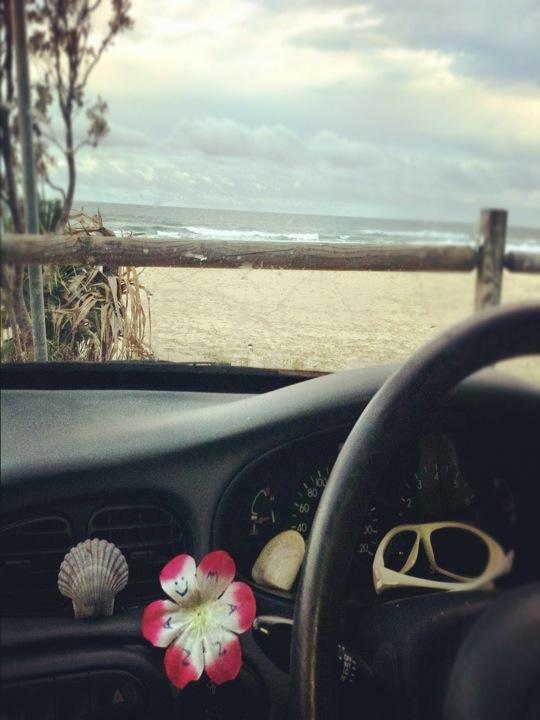 From there I headed another half an hour south, until I got to 'North Valla Beach', just north of 'Nambucca'. This turned out to be a pretty remote place, with only a tiny little village and an average beach. So again I just walked about and saw the sights, drew some touristy 'Edd, 2012, Australia' in the sand, before heading 2 minutes to 'South Valla Beach' just over the headland. On the way there I came across a really nice lookout spot, where I sat for about 20 minutes watching Humback Whales throwing themselves in the air and kicking their tales around, all about 300m from the cliffs. It's probably one of the best sightings I have had yet. When I got down to South Valla Beach despite not being a completely clear skies sunny day, it was warm enough to lay about, so that's just what I did but near the car so I could charge my iPhone up after using all the battery at Maccas. While I was there a very hippy-ish local woman started chatting to me, which I was actually great full for the conversation really. Amongst other things she told me about a place about 15 minutes North West of here to the mountainous inland area. Apparently it is very beautiful, and as there arent meant to be many waves the next few days, I though I might as well check it out..see what happens tomorrow..
Later on I cooked up some pasta, red sauce and tuna for dinner, then just bummed about by the beach, sorted the car out and went to bed. Im staying in the beach car park, but it's pretty remote, so I hope the Rangers don't frequent it..